What is Sai no Kami? Let’s look at the basic schedule of a Sai no Kami festival. Each region has its own schedule and may celebrate the festival in different ways. If you’re interested in learning more about participating, please check each region’s page on the calendar. 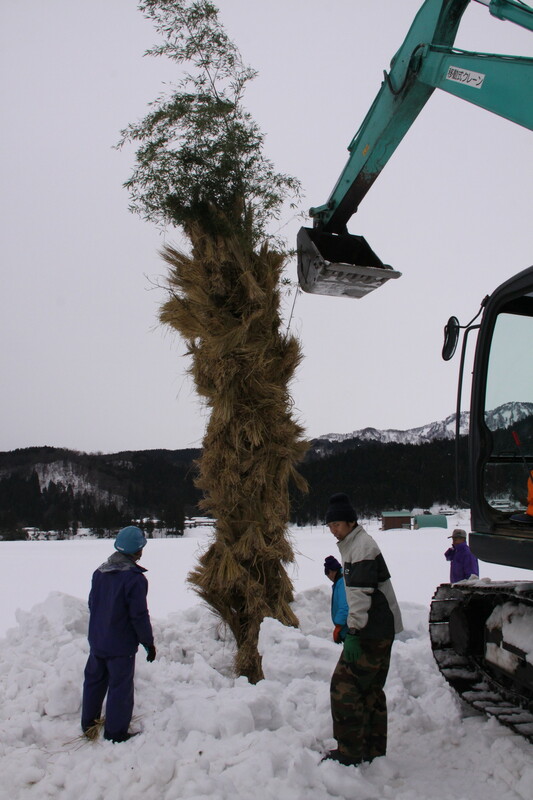 First, the bamboo and young trees that will form the support for the Sai no Kami pyre are cut down and dragged from the forests and mountains atop the snow. 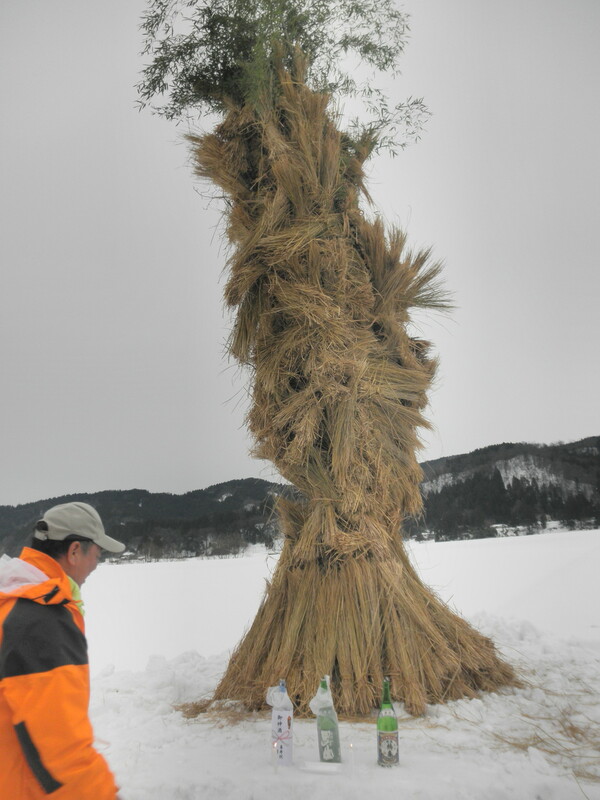 Bundles of straw are fastened to the trees and bamboo. 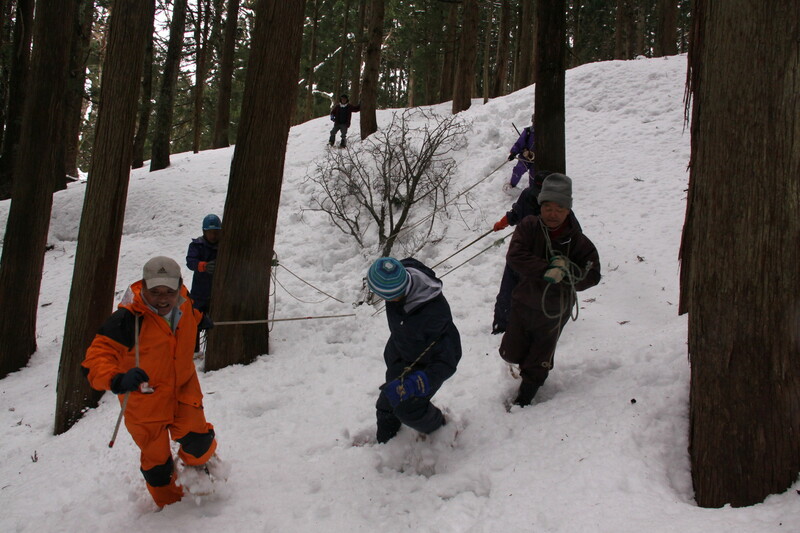 The branches of the trees are tied to their trunk with string. As the pyre burns, these strings break and the branches burst open in a fiery display. 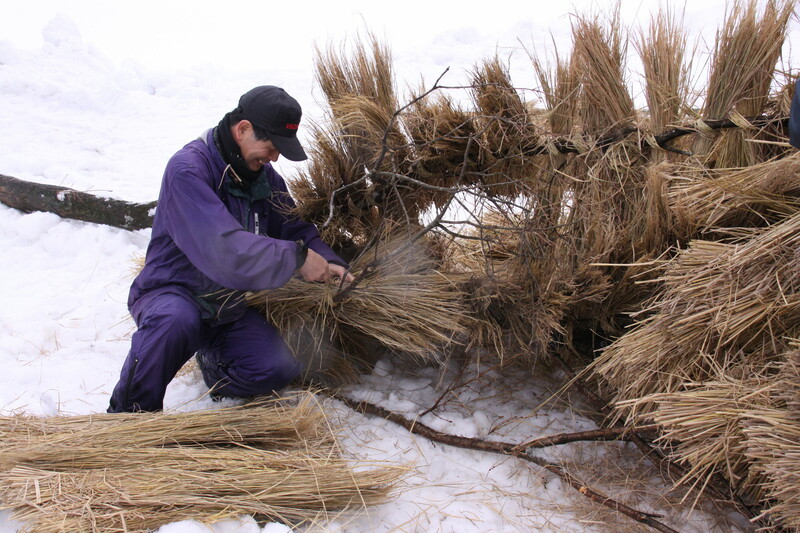 After it’s completed, the Sai no Kami pyre is erected in an open field or rice paddy far away from anything burnable. 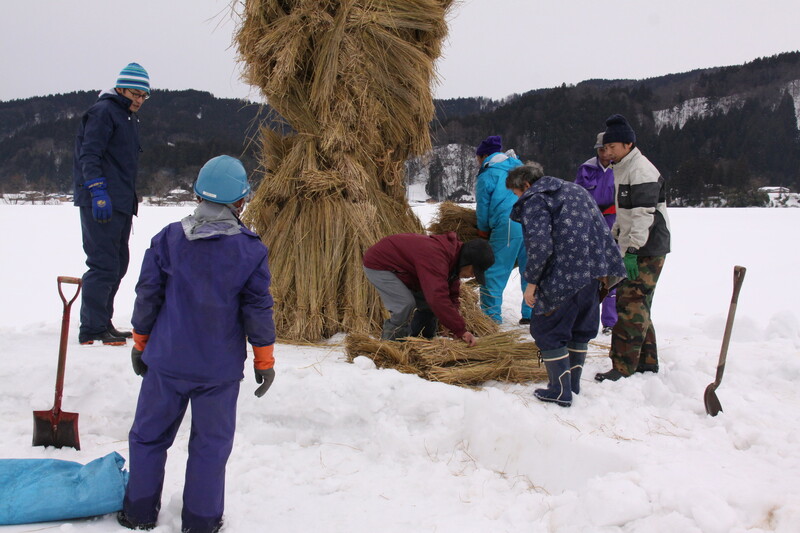 The pyre is secured down with many ropes so that it won’t fall down even in Itoigawa’s heavy snow and fierce winter winds. 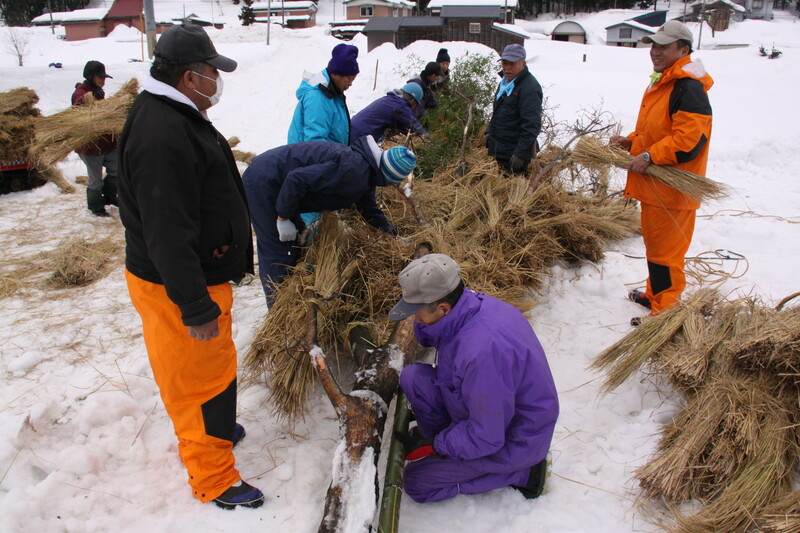 Straw is piled around the base of the pyre and an altar is built either on the pyre itself or in the snow to give sake and other offerings. Each region has its own ways of deciding who lights the pyre. In some it is lit by the toshiotoko and toshionna, men and women who were born under the same Japanese astrological sign as the New Year. In others it is lit by those who will be coming into their yakudoshi or Unlucky Year. These are certain ages which are traditionally considered very unlucky in Japanese mysticism. 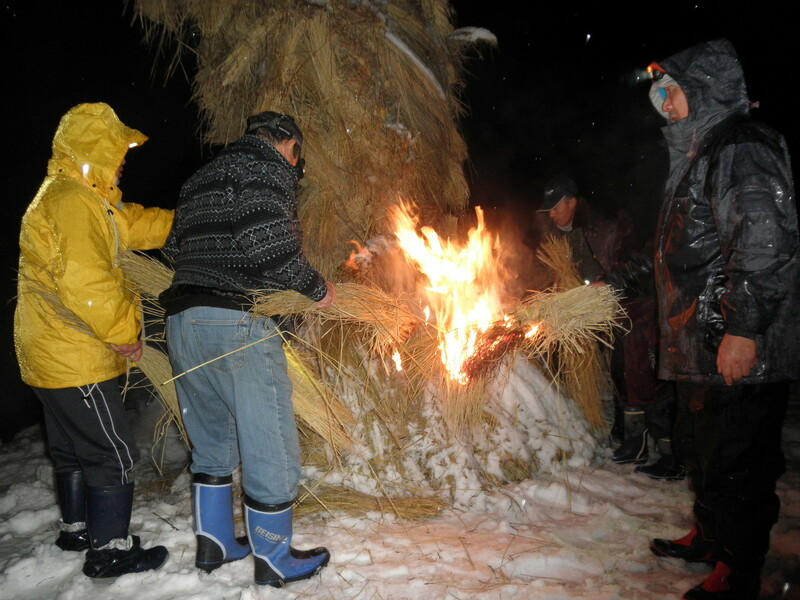 The people chosen to light the fire first set fire to bundles of straw which they carry to the base of the pyre until it ignites in a fiery spectacle enjoyed by the entire community. 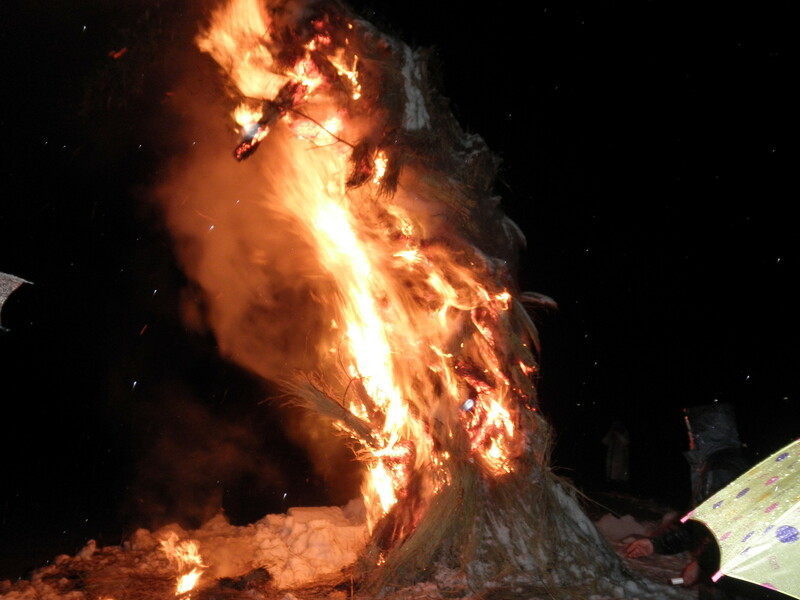 After the Sai no Kami finishes burning, the festival comes to a close.